Season Two (Book Two: Earth) of Avatar: The Last Airbender, an American animated television series on Nickelodeon, first aired its 20 episodes from March 17, 2006 to December 1, 2006. The season was created and produced by Michael Dante DiMartino and Bryan Konietzko, and starred Zach Tyler Eisen, Mae Whitman, Jack DeSena, Jessie Flower, Dante Basco, Dee Bradley Baker, Mako Iwamatsu and Grey DeLisle as the main character voices. In this season, Aang and his friends Katara and Sokka are on a quest to find an Earthbending teacher which finishes when they recruit Toph Beifong. After finding important information concerning the war with the Fire Nation, Appa ends up kidnapped. Their journey leads to Ba Sing Se, the capital of the Earth Kingdom, where they uncover great internal government corruption. Meanwhile, due to their actions at the North Pole, Zuko and Iroh are declared enemies of the Fire Nation and desert their country, becoming fugitives in the Earth Kingdom. Pursuing both Zuko and Aang is Princess Azula, Zuko's younger sister. Throughout the season's airing, the show received much critical acclaim, with praises such as, "As a flat concept, Avatar: The Last Airbender is nothing special, but in execution, it is head and shoulders above other children's entertainment", and that "as a whole, the look of Avatar is consistently excellent." Season 2 won multiple awards, including the "Best Character Animation in a Television Production" award from the 34th Annie Awards and the "Outstanding Individual Achievement in Animation" award from the 2007 Emmy Awards. Between January 23, 2007 and September 11, 2007, Nickelodeon released five DVD sets for the season: four sets containing five episodes each, and a fifth DVD collection of all twenty episodes. All DVDs were encoded in Region 1. In the United Kingdom, only the season boxset was released without being released in four volumes first. The boxset was released on July 20, 2009. The season was produced by and aired on Nickelodeon, which is owned by Viacom. The season's executive producers and co-creators are Michael Dante DiMartino and Bryan Konietzko, who worked alongside episode director and co-producer Aaron Ehasz. Most of the individual episodes were directed by Ethan Spaulding, Lauren MacMullan and Giancarlo Volpe. Episodes were written by a team of writers, which consisted of Aaron Ehasz, Elizabeth Welch Ehasz, Tim Hedrick, John O'Bryan; along with creators DiMartino and Konietzko. 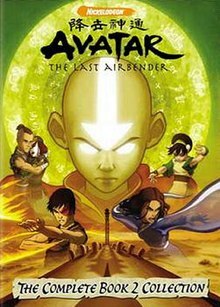 Most of the main characters from the first season remained the same: Zach Tyler Eisen voices Aang, Mae Whitman voices Katara, Jack DeSena voices Sokka, Dee Bradley Baker voices both Appa and Momo, and Dante Basco voices Zuko. Mako Iwamatsu, who voiced Iroh, died from throat cancer after production was completed; he was replaced by Greg Baldwin for the following season and The Legend of Korra. For the video and audio quality, Powers says "Season two generally looks better than the bulk of season one, but still has some issues" concerning image sharpness. Rotten Tomatoes gave it an 87% fresh rating in 2008. Jamie S. Rich from DVD Talk says that "As a flat concept, Avatar the Last Airbender is nothing special, but in execution, it is head and shoulders above other children's entertainment", and that "as a whole, the look of Avatar is consistently excellent". The show also received acclaim for its visual appeal. In the 34th Annie Awards, the show was nominated for and won the "Best Character Animation in a Television Production" award, for Jae-Myung Yu's animation in "The Blind Bandit", and the "Best Directing in an Animated Television Production" award, for the episode "The Drill". In 2007, the show was nominated for "Outstanding Animated Program" in the 2007 Emmy Awards for the "City of Walls and Secrets" episode, though it did not win. However, the show did win the "Outstanding Individual Achievement in Animation" award for Sang-Jin Kim's animation in the "Lake Laogai" episode. Aang and his friends rest at an Earth Kingdom outpost after their journey from the North Pole. They are to be escorted to Omashu, where Aang intends to find King Bumi to teach him earthbending. But General Fong, inspired by Aang's battle-determining actions during the Siege of the North, suggests that Aang defeat the Fire Lord and end the war immediately by triggering the Avatar State. In the meantime, Zuko and Iroh are visited by Zuko's sister, Azula, who has come bearing a message from the Fire Lord, requesting their return home. After many failed attempts, General Fong finally succeeds in triggering the Avatar State by faking Katara's death. Aang nearly destroys the base in anger but is then told by Avatar Roku that if he is killed in his Avatar State the Avatar Spirit will cease to exist, bringing to an end the cycle of reincarnation which preserves the Avatar as a force for balance in the world. The group decides to go to Omashu alone. Iroh reluctantly accompanies Zuko to Azula's ship where a Fire guard accidentally reveals that Azula's summons is a ruse in order to imprison Zuko and Iroh. Uncle and nephew manage to escape but are forced to become outcasts because of Iroh's efforts in saving of the Moon Spirit at the North Pole are viewed as a treachery by the Fire Nation, and Zuko's failure to capture the Avatar has made him a target as well. While on the way to Omashu, Aang and the group meet a group of carefree traveling bards, who take them through a vast tunnel known as the Cave of Two Lovers. Zuko and Iroh are sheltered by kind villagers after Iroh accidentally drinks tea made of a poisonous plant. Song, a young and compassionate healer, shows Zuko the effects of war from a normal citizen's perspective. Aang and Katara grow even closer as they discover the origins of the cave, which includes the tombs of the first two earthbenders. Their torch burns out, plunging them in darkness thus revealing glowing lights in the ceiling, allowing the group to escape and make it to Omashu, which they discover has come under control of the Fire Nation. Omashu has been captured by the Fire Nation. Aang and friends sneak in and are nearly captured, but Sokka fakes a deadly illness (pentapox) to scare off the guards. They meet a resistance movement, and help the city's entire population escape by faking an epidemic. The Fire Nation Governor's infant son Tom-Tom accidentally leaves with the citizens. Aang attempts to trade him for King Bumi, but Princess Azula, calls off the trade; she is now backed up by her friends Mai and Ty Lee, recently re-recruited because each is a skilled fighter. Aang manages to rescue Bumi after a fight with Azula, but Bumi allows himself to be recaptured, saying that the proper time for his escape has not arrived and that he will wait out his capture a little longer so as to catch the Fire Nation unawares at the most beneficial moment. He instructs Aang to find an earthbending teacher who "waits and listens before striking". While flying, Aang and friends are attracted to a mysterious swamp and get separated from one another. They begin to see unique illusions in the swamp: Sokka sees Princess Yue, Katara sees her dead mother, and Aang sees a mysterious girl and a flying boar. They are reunited and attacked by a swamp monster who turns out to be a wise man from a tribe of swamp waterbenders who use the moisture inside the swamp's plants to manipulate the plants and hide their identities. He explains that all beings are connected, as the swamp is a single large tree, and the visions are of people they have met or will meet. Meanwhile Zuko, disgusted with having to live as a beggar, dons the mask of the Blue Spirit once again. Aang and friends stumble upon a town celebrating an Anti-Avatar Day. The villagers blame Avatar Kyoshi, one of Aang's previous incarnations in the avatar cycle of reincarnation, for killing their leader, Chin the Great. Aang reveals his identity and is arrested and put on trial for Kyoshi's supposed crimes. Zuko disguises himself as the Blue Spirit to steal food for himself and his uncle. Iroh is not happy with what Zuko is doing, and Zuko decides to strike out on his own. Aang recalls the events that led to Chin the Great's death; a conqueror, he was confronted by Avatar Kyoshi and died from a fall when he refused to back away from a chasm Kyoshi formed to protect a people he had been trying to subjugate. Aang is pardoned after he defeats a group of Fire Nation soldiers that attack the village, and the town changes the anti-Avatar celebration to a pro-Avatar celebration. Aang is searching for an earthbending teacher, but with little success. While at Xin Fu's earthbending tournament, Team Avatar witnesses a display of powerful earthbending by a young blind girl named Toph, who Aang recognizes as the girl from his vision in the spirit swamp. Toph uses her earthbending to sense her environment, perceiving the lay of the land around her and the subtlest movement of her adversaries, allowing her to launch effective counter-attacks; she therefore fits Bumi's advice that Aang's earhtbending instructor should be someone who "listens and waits before attacking". But Toph cannot become Aang's teacher due to her wealthy and overprotective parents, who attempt to keep her isolated from any danger and to form her into an obedient daughter who conforms to the expected social roles of a young woman of the Earth Kingdom aristocracy, despite the fact that Toph is by nature tough, sarcastic, and intentionally unrefined. Xin Fu kidnaps Aang and Toph thinking he was cheated. Toph reveals her power by defeating Fu's gang, but her parents become even more restrictive. She runs away from home and joins Aang. Toph's parents, believing Aang has kidnapped her, promise Xin Fu and Master Yu a chest of gold if they bring her back. After leaving his uncle, Zuko continues his journey to an Earth Kingdom town where a young boy named Lee befriends him. Zuko remembers his childhood, including Azula's psychopathic behavior and his own perseverance. Finally he recalls his mother's last words and the announcement that his grandfather died and his mother has suddenly disappeared. As Zuko defends the family against abusive Earth Kingdom soldiers, he reveals his identity as the Fire Prince at the battle's end, and the boy, his family, and the townspeople reject him because of it. Aang and his friends are chased by a mysterious machine, which makes it impossible for the group to stop and sleep. The lack of sleep makes everyone irritable, and causes a quarrel between Katara and Toph. Toph blames Appa for the chase and the group realize that she is correct: they are being tracked because Appa is shedding. Aang takes some of Appa's fur to act as a decoy to lure their pursuers away, but he is cornered by Azula. His friends, joined by momentarily by Zuko and his uncle, arrive to take Azula down together, but she injures Iroh and utilizes the ensuing chaos to escape. Aang finally begins his earthbending training with Toph, but grows frustrated when he encounters difficulty with the earth element, the natural opposite of air; Avatars tend to have more difficulty in learning some elements than others, a reflection of their personalities, and Aang's inclination towards evading and staying ahead of threats and challenges puts him at a disadvantage with earthbending, which requires a more direct, resolute form of willpower. Eleswhere, Zuko struggles with a similar dilemma as Iroh tries to teach him lightning-bending, an advanced form of firebending; Zuko's anger keeps him from having the cold precision lightning bending requires, and he is accutely aware it is a skill both his father and sister have mastered. Deciding on another approach, Iroh shares with Zuko his belief that wisdom comes from many sources, and he describes the relative strengths of each of the four elements, and the nations associated with them, and advises that understanding the other elements and other ways of life makes one whole. Iroh then teaches Zuko the art of redirecting lightning, a firebending technique he created himself by studying waterbenders. Aang finds Sokka in danger from a Moose-Lion and is able to save him by firmly standing his ground as an earthbender would. Sokka decides the group needs some intelligence to defeat the Fire Lord. At an oasis, the group encounters a professor who tells them about a hidden Spirit Library in the desert. The group travels deep into a massive and forbidding desert and eventually locate an entrance to the library, but Toph, who is unnerved by sand because it partially disrupts her ability to sense her surroundings with her bending, refuses to descend with the others and stays outside with Appa. Inside, Sokka discovers a crucial weakness to the Fire Nation that could end the war: the date of the upcoming solar eclipse which will temporarily prevent the bender of the Fire Nation from firebending for its duration. The spirit of the library, Wan Shi Tong, refuses to allow them to leave with the knowledge and sinks the library into the sand. Meanwhile, Appa is kidnapped by sandbenders when Toph, much closer to being truly blind than normal, is unable to stop them. The others escape from the library but are devastated by the loss of Appa. The gang is stranded in the desert, without sufficient provisions to make the trek out again now that they no longer have Appa. Elsewhere, Iroh reveals a mysterious association with some form of secret society when he uses a White Lotus tile as an opening in a match of Pai Sho, his favorite game. The move functions as some sort of message to his opponent, who then helps protect Iroh and Zuko from a Fire Nation search. However, in the process, they are seen and recognized by the same mercenaries who are searching for Toph, and the bounty hunters plan to capture Iroh and Zuko, who are valuable prisoner in both the Earth Kingdom and Fire Nation. After a long trek and much hardship in the desert, Aang tracks down the sandbenders who stole Appa, and learns that Appa was traded to a merchant and is likely in Ba Sing Se, the imposing capital city of the Earth Kingdom. Upon hearing that Appa was muzzled, Aang becomes so angry and upset that he enters the Avatar State, almost wiping out the sandbenders, but is eventually calmed by Katara. After leaving the desert, the group fortuitously meets up with Suki and the Kyoshi Warriors, and attempts to lead a couple through the Serpent's Pass, a dangerous route to the outlands of Ba Sing Se. They are attacked by a giant sea serpent, but ward it off and make it past. Meanwhile, Zuko and Iroh, assuming identities as Earth Kingdom refugees, are also on their way to start a new life in the Earth Kingdom capital, and encounter Jet and some of the Freedom Fighters, with whom Zuko starts to bond. The group finally makes it to Ba Sing Se only to find the Fire Nation is about to send a gigantic drill to penetrate the titanic outermost walls of the capital region, which have protected the people within, including the Earth Kingdom leadership, form more than a century of Fire Nation assault. Having successfully crossed the Serpent's Pass, Aang is determined to go to Ba Sing Se where he hopes to find his lost sky bison, Appa. However, he discovers a Fire Nation drill commanded by Azula heading straight for Ba Sing Se, intent on penetrating the wall. Battling against Azula, Mai, Ty Lee, and contingent of firebending soldiers, Aang and the group succeed in stopping and destroying the drill from the inside. Meanwhile, Jet wishes to recruit Zuko for his Freedom Fighters, but then learns that Zuko and Iroh are firebenders after deducing that Iroh used firebending to warm up a lukewarm cup of tea. Aang and the rest of the group arrive in Ba Sing Se, determined to find Appa and inform the Earth King about upcoming opportunity the solar eclipse will provide to strike back against the Fire Nation. However, they soon discover that the protocols and bureaucracy of the royal court and aristocracy surrounding the Earth King keep them perpetually stalled from making contact with him. They are assigned a liaison, an uncomfortably cheerful young woman named Joo Dee, who indirectly makes it clear to them that any mention of the war is forbidden within the walls of the city, one of many disturbing rules they begin to encounter that are enforced by the Dai Li, the secret police of Ba Sing Se, and their corrupt leader, Long Feng, who appears to know something about Appa. Elsewhere, Jet repeatedly tries and fails to gather evidence that Zuko and Iroh are firebenders, and his allies in the Freedom Fighters begin to believe he is losing his steel. His last attempt, challenging Zuko to a sword fight, ends in his own arrest and being brainwashed by the Dai Li into believing there is no war in the city. Note: This was nominated a Primetime Emmy for "Outstanding Animated Program (For Programming Less Than One Hour)". "The Tales of Ba Sing Se" is a set of vignettes about each of the main characters' adventures in Ba Sing Se, providing a glimpse of their personalities and private lives. "The Tale of Toph and Katara" – Katara and Toph have a girls' day out in the inner city. "The Tale of Iroh" – Iroh interacts with and provides small kindnesses to various impoverished people in the outer city, before venturing out of the city to find a place to mark the birthday of his son, Lu-tan, who was killed in the siege of Ba Sing Se many years previous. Kneeling before a portrait of his son, Iroh tearfully sings "Leaves from the Vine", a folk song about a young soldier returning home. "The Tale of Aang" – Aang helps a zookeeper build a new zoo. "The Tale of Sokka" – Sokka accidentally ends up in a girls-only poetry club. "The Tale of Zuko" – Zuko goes out on a date, and fumbles with every aspect of it. "The Tale of Momo" – Momo looks through Ba Sing Se for Appa, and succeeds. Note: Iroh's tale was dedicated to his voice actor Mako Iwamatsu, who had just died 7 days after Chapters 10 and 11 initially aired. Chapter 16 tells the story of Appa's hardships after being abducted many episodes previous. After being abducted, Appa is traded to circus run by Fire Nation citizens where the circus trainer whips, humiliates, and generally mistreats him, though the Sky Bison eventually escapes with the help of a small boy. He later unwillingly enters a fight with a Boarcupine, and wins but is badly wounded. By fortune, Suki and the Kyoshi warriors come across Appa and help him recover from his injuries, but the warriors are attacked when they encounter Azula and her team, still not far outside Ba Sing Se and attempting to infiltrate it. Appa is forced to flee at Suki's urging, lest he be hurt in the ensuing battle between Azula's forces and the Kyoshi Warriors. Completely dispirited, confused, and longing for Aang, Appa returns to his childhood home at the Eastern Air Temple, where he discovers a mysterious guru has taken residence in the ruins. The guru senses the terrible burden within Appa, nurses him back to health and imparts to him Aang's location; before sending Appa to be reunited with Aang, the guru attaches a message for Aang to Appa's harness. Appa arrives at Ba Sing Se, but just short of reuniting with Aang he is ambushed and captured by Long Feng. Note: This episode won a Humane Society award for its portrayal of the mistreatment of animals. Finally having enough of the rules of the city and the obstruction of the Dai Li, the group decides to evade their constraints to find Appa. As they do so, the gang meet Jet again, although he does not behave as they would expect. They find Smellerbee and Longshot and realize Jet was brainwashed by the Dai Li. They travel to a facility located at the bottom of Lake Laogai, in the hopes of finding Appa. Instead, they find Long Feng and the Dai Li waiting for them. Elsewhere, Zuko discovers that Aang is in the city and sets out in the disguise of the Blue Spirit to find him, and believes he has hit on a winning strategy when he discovers the imprisoned Appa. However, with encouragement from his uncle, Zuko decides to free the sky-bison and give up the Blue Spirit alter-ego forever. After an intense battle between Team avatar and the Dai Li on the surface, during which Jet is killed by Long Feng, Aang and Appa are finally reunited. The group breaks into the Earth King's palace to warn Earth King Kuei about the War, having discovered that in Ba Sing Se, even the King is now kept ignorant of the reality of how far the Fire Nation has encroached in the Earth Kingdom. The team eventually convince the King by showing him the destroyed Fire Nation drill and Long Feng is arrested for treason. Meanwhile, Zuko succumbs to an illness which Iroh believes is a manifestation of the deep internal conflict within his nephew, as he attempts to grapple with the gulf between his inner self and his image of what he thinks is required of him as a prince of the Fire Nation. Elsewhere, Azula and her cohorts infiltrate the city, disguised as the Kyoshi Warriors. After Team Avatar receives letters that were confiscated by Long Feng, Aang travels to the Eastern Air Temple and meets Guru Pathik, who trains him to master the Avatar State through the unlocking of chakras, to bring Aang closer to spiritual enlightenment and allow him to enter a controlled form of the state at will. Toph is captured by Xin Fu and Master Yu, who attempt to transport her back to her parents; they lock her in an iron enclosure to negate her powerful earthbending, but the experience leads Toph to an epiphany when she realizes that there are tiny bits of earthen material within the metal, which she can use to manipulate it; Toph tears open the enclosure, creating a new form of earthbending in the process: metal bending. Long Feng is tricked into a deal with Azula where he will exchange Aang for assistance in regaining control of the Dai Li and consolidating their power over the Earth Kingdom throne, which will then act as a proxy government for the Fire Kingdom. At the air temple, Aang slowly unlocks all chakras but for the seventh and last, which requires giving up all earthly attachments, the most significant of which is now his deep affections for Katara. Almost at the point of true enlightenment, Aang sees a vision of impending danger for Katara and retreats from disattachment, instantly deciding to return to her and protect her at all costs, even though Guru Pathik warns that this may leave Aang's final chakra inaccessible, compromising his ability to safely and reliably access the Avatar State at all. With Long Feng released, Zuko prepares to capture the Avatar. Before he can do so, Azula takes control of the Dai Li (and hence Ba Sing Se), explaining that they admire her brutal discipline. She has Zuko imprisoned, whereupon he meets Katara for the first time outside of his attempts to capture Aang, and the two discover they share a lot in common. When Aang, aided by Iroh, attempts to free Katara, Zuko is told by his uncle that he must carefully consider the path that his next actions will set him upon, hoping that the prince will embrace his innate inner light and abandon the brutality his father has tried to imprint upon him. To Iroh's dismay, Zuko instead chooses to help Azula attack the Avatar. In the battle that follows, Aang realizes that he must let go of Katara in order fulfill his destiny, and meditates into the Avatar state, but Azula hits him with lightning while in the Avatar State, striking him in exactly the location of the Chakra the Guru had cautioned him about, and putting the Avatar near the brink of death. Launching into an offensive, Iroh delays Azula, Zuko, and the Dai Li long enough to allow Katara to escape along with the gravely injured Aang, and then surrenders, being taken prisoner as a traitor to the Fire Nation. Katara uses a vial of spirit water earlier given to her from the pool of the spirits after the Siege of the North in order to save Aang as the team, with a deposed Earth King Kuei in tow, flees from Ba Sing Se, now in the hands of the Fire Nation after a century of resistance. Nickelodeon began releasing DVDs for Book 2 on January 23, 2007. The first four DVD releases contain one disc that consisted of five episodes each. The final DVD was the "Complete Book 2 Box Set", which contains all of the episodes in the season on four discs, and packaged with a special features disc. All of the DVD sets for Book 2 were released with Region 1 encoding, meaning that they can only play on North American DVD players. Book 2 was released on Region 2 on July 20, 2009. "Season 2 DVD Information". TVShowsOnDVD.com. February 24, 2005. Archived from the original on 15 September 2008. Retrieved September 6, 2008. ^ a b "IGN: Avatar: The Last Airbender: Season 2". IGN Entertainment. Archived from the original on 29 September 2008. Retrieved October 22, 2008. ^ a b c d e "Avatar: The Last Airbender Cast and Details". TVGuide.com. Archived from the original on 16 December 2008. Retrieved November 26, 2008. ^ a b Rich, Jamie S. (September 12, 2007). "Avatar The Last Airbender — The Complete Book 2 Collection". DVD Talk. Retrieved June 6, 2008. ^ a b "Annie Awards: Legacy - 34th Annual Annie Awards". International Animated Film Society. February 9, 2006. Archived from the original on 9 May 2008. Retrieved April 26, 2008. ^ a b c Mesger, Robin (September 8, 2007). "59th Creative Emmy Awards Winners" (PDF). Academy of Television Arts & Sciences. pp. 11–12. Archived from the original (PDF) on November 28, 2007. Retrieved June 5, 2008. ^ a b "Season 2 DVD Information". TVShowsOnDVD.com. February 24, 2005. Archived from the original on 15 September 2008. Retrieved September 6, 2008. ^ "Dante Basco". 2005. Retrieved March 31, 2008. ^ a b Powers, Gabriel. "Avatar: The Last Airbender, Book 2, Vl.1". DVDActive. Archived from the original on 2008-10-11. Retrieved June 5, 2008. ^ Powers, Gabriel. "Avatar: The Last Airbender, Season Two Collection". DVDActive. Archived from the original on 2008-11-21. Retrieved June 5, 2008. ^ "59th Creative Emmy Awards Nominations" (PDF). Academy of Television Arts & Sciences. 2007. p. 1. Archived from the original (PDF) on September 27, 2007. Retrieved June 5, 2008. ^ "The Avatar: The Last Airbender Series". Amazon.co.uk. Amazon.com, Inc. Archived from the original on August 1, 2008. Retrieved June 5, 2008. ^ "Buy Avatar: The Legend of Aang - Book 2: Earth - Volume 1 on DVD-Video from EzyDVD.com.au". ^ "Buy Avatar: The Legend of Aang - Book 2: Earth - Volume 2 on DVD-Video from EzyDVD.com.au". ^ "Buy Avatar: The Legend of Aang - Book 2: Earth - Volume 3 on DVD-Video from EzyDVD.com.au". ^ "Buy Avatar: The Last Airbender - Book 2: Earth - Volume 4 on DVD-Video from EzyDVD.com.au". ^ a b "Avatar: The Last Airbender — Season Two DVD Information". TVShowsOnDVD.com. Archived from the original on 4 November 2008. Retrieved October 28, 2008. ^ "Buy Avatar: The Last Airbender - The Complete Book 2 Collection (4 Disc Box Set) on DVD-Video from EzyDVD.com.au". Archived from the original on 2010-09-09.